​​ MAGNOLIA, MONTGOMERY COUNTY – City Council approved amending the city’s zoning districts and land-use regulation to allow for mixed-use commercial and residential projects in May 2018. 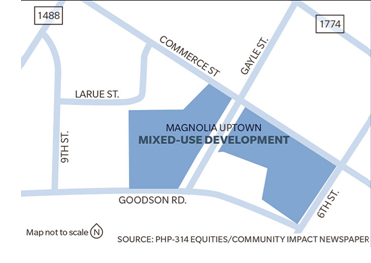 Magnolia Uptown, the unofficial name for the development, is a two-acre, four-story development that will include one- and two-bedroom apartments with about 24,000 sf of retail space beneath them. Property management firm PHP-314 Equities is developing Magnolia’s first mid-rise mixed-use development to be located in downtown Magnolia on Commerce St.
Construction is slated to begin in spring 2019. The proposed site was obtained from Living Waters Assembly of God located in Magnolia. The design includes enhancing Seventh Street—also called Gayle Street—into a pedestrian-only walkway.